Pay no attention to the sign. I found myself back at Waimea Bay around sunset last night enjoying the beauty and watching in awe as the locals jumped off of the huge rock. I wanted in, but of course I decided I’ll wait until “tomorrow” to do it. (Maybe this is part of a general procrastination problem I have). A TV mogul/adjunct professor once said to me jokingly, “Why do today what you can put off until tomorrow?” I love that quote when it comes to things I don’t really want to do. Then all of a sudden that bug came over me and I had to jump. I climbed up the back of the rock, looked over the edge and asked one of the locals a couple of questions about form and where to jump. He assured me it’s easy and an all sand bottom. Like many things in life, rather than wait around so I second guess myself or become paralyzed with fear, I stepped up to the edge and catapulted off the rock. It looks a lot higher from the edge of the rock than when you are sitting on the beach watching the locals do backflips off of it. I jumped, I screamed, I hit the water. I’m sure the judges would have given my form a 6.5, but I was hooked. 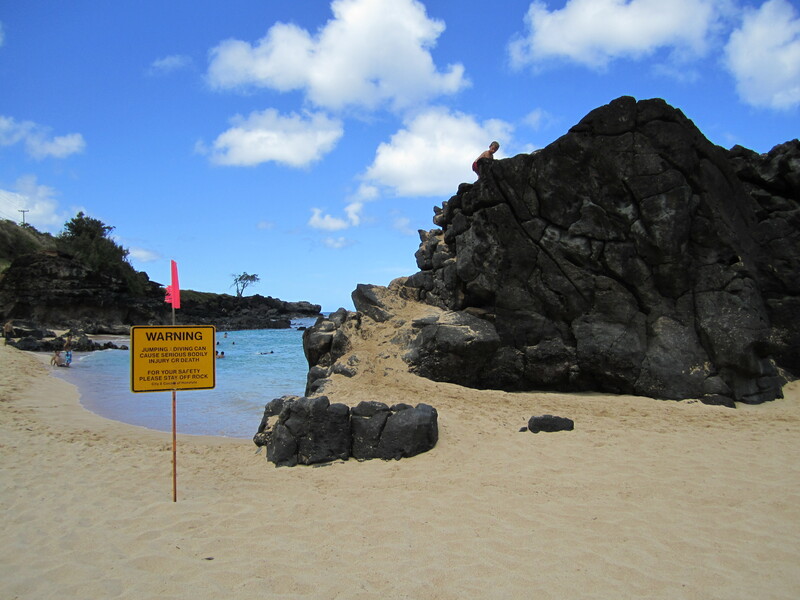 Pretty soon I’ll be doing back flips off the rock at Waimea just like the ke’iki that have been doing it for years.